This team of sled dogs are pulling through a winter scene ready for your child to bring his crayons to the coloring page. Finish the Drawing: What Kind of Animals Can You See? This Finish the Drawing animals worksheet encourages your child to fill in the gaps of the picture. Try this Finish the Drawing animals worksheet with your kid. Finish the Drawing: What Kind of Pet Does She Have? Get your little one's creative mind working with this Finish the Drawing worksheet. Your child will decide what animal is on the end of a little girl's leash. 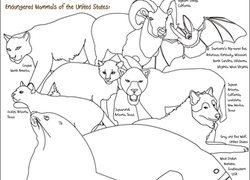 Learn about the endangered animals of the United States by coloring them. The forest animals have come out to play this Christmas. 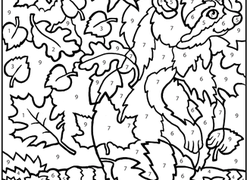 This coloring page is a fanciful idea for any animal-loving kid to color in. This lion dot-to-dot gets your child thinking as he counts by threes. Connect the dots using skip counting in this lion dot-to-dot. How much do you know about the animals of the rainforest? Here is a great coloring worksheet that doubles as a memory matching game! Does your child need to boost her memorization skills? Try this fun memory matching game, featuring rainforest animals. This Charlotte's Web coloring page lets young fans add color to Charlotte, the spider whose spelling and web-spinning talent helps her friend Wilbur the pig! Looking for a way to hone your child's memorization skills? Try this great paper project, complete with rainforest animals to color and learn! Teach your child a few great new rainforest animals with these memory cards. This baby giraffe coloring page features a sweet moment between a mother giraffe and her calf. Learn about a common hawk native to North America, the Red-Tailed Hawk! Your child will love coloring this page as he reads some fun facts about this species. Learn about a few cool new animals of the rainforest! Color them in, and turn them into flashcards or matching cards to play a memory game!